Aspiring martyrs aside, most of us would put a long and happy life pretty high on our list of personal priorities. Our chances of a long life (Figure 1) are somewhat a function of dumb luck—accidents and genes pick no favorites. But there are also individual behaviors we can choose to take; actions our loved ones and our scolds have encouraged us to adopt—like healthy diets and regular exercise. Finally, findings from science can be applied to increase lifespan—for example, in public sanitation, universal vaccination, and access to medical care. New research continues to educate us on how public policy contributes to how long we live. We have known for a while that in the US how long you live depends on where you live, your gender, your race and ethnicity, and your income. Hawaiians live longer than Mississippians, women live longer than men, Hispanics live longer than whites or African-Americans, and rich people live longer than poor people. But what causes these differences? It is, as one might say, “complicated.” Analysis from the Institute for Health Metrics and Evaluation (IHME) at the University of Washington estimated that 75% of that geographic variation can be attributed to the prevalence of five risk factors for chronic disease—obesity, lack of exercise, smoking, hypertension, and diabetes. Separately, the IHME analysis indicated that socioeconomic factors—the combination of poverty, income, education, unemployment, and race—explained 60% of the variation. To what extent can these risk factors and socio-economic circumstances be changed by public policy? Apparently policies can make a difference. Work by Raj Chetty and his colleagues shows that the gap in life expectancy between wealthy and poor people is much lower in some cities than in others. Now, a new study by IHME shows that the same seems to be true for risk factors: state policy makes a difference. Their research measures changes in life expectancy by state between 1990 and 2016 and in the risk factors that caused them. Life expectancy is changing at different rates in different states. Since the distribution of dumb luck and virtue among us probably has not shifted much over time—my home state of Rhode Island is no more or less saintly now than in the past—something else is going on in the states to drive these changes. Public policy in different states is applying the science in different ways. First, the good news. According to IHME, between 1990 and 2016, life expectancy increased in the US—from 78.9 years to 81.2. While these numbers still lag behind that of other countries, are rising more slowly than earlier in the 20th century, and are not shared across all racial and socio-economic groups, in general we are making some progress. How long you can expect to live still depends on where you live, however. In 2016, Mississippi had the lowest life expectancy at birth of 77.9, while residents of Hawaii could expect to live a full 6.2 years longer. And while life expectancy increased in the US, the gains were not evenly spread. The gap in life expectancy among states is increasing—up from 4.1 years in 1990. Parents of kids born in Oklahoma and West Virginia in 2016 could expect their offspring to live no longer than fellow Sooners and Mountaineers born in 1990, whereas kids born in New York on average will live almost 4.5 years more. Figure 2 shows the states that made the biggest relative gains and losses. Note: States highlighted in red gained ten or more spots. 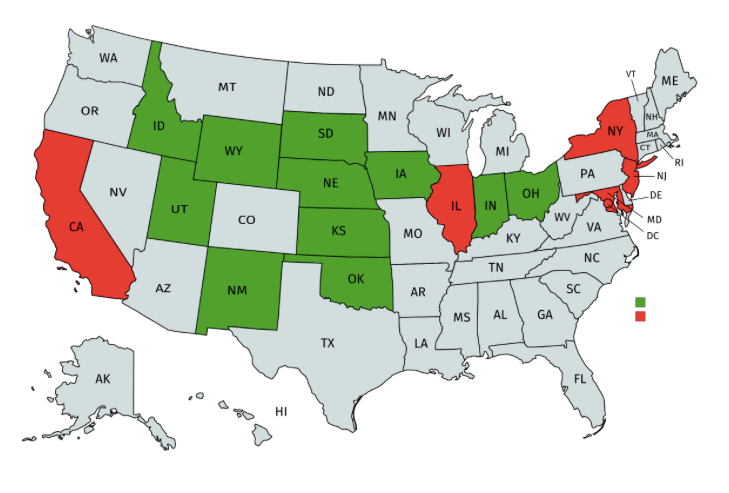 States highlighted in green lost ten or more spots. What were the characteristics of the states that made big changes (positive or negative) in their life expectancy rankings? The changes don’t seem to reflect a rich state/poor state dynamic. According to the Bureau of Labor Statistics, Nebraska, South Dakota, Iowa, Oklahoma, and Wyoming were all in the top 10 for growth in state gross domestic product between 1997 and 2015, yet all saw significant drops in their ranking for life expectancy. Instead, according to IHME, changes in life expectancy by state were largely driven by changes in the prevalence of those pesky risk factors. The states that made big gains all benefited from large reductions between 1990 and 2016 in the probability of residents between the ages of 20 and 55 dying from infectious diseases—HIV/AIDs particularly. 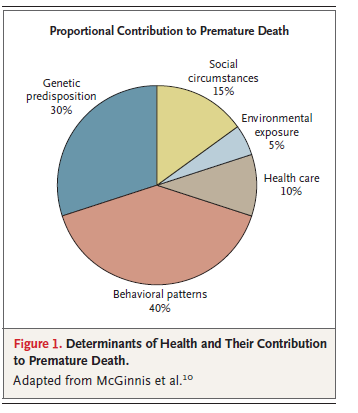 In contrast, states that saw big declines in their ranking for life expectancy probably saw notable increases in their residents dying from mental health and substance use disorders (presumably due to the opioids crisis), as well as cirrhosis and other diseases of the liver, self-harm and interpersonal violence, chronic respiratory diseases, and diabetes. These changes in risk factors at the state level are not random occurrences or because citizens in some states became more virtuous than in others, but can be traced to public policy decisions. Increased insurance rates mean more access to pharmaceuticals and a lower burden of HIV/AIDs. Tobacco taxes and bans on indoor smoking reduce the incidence of chronic respiratory diseases. Better access to behavioral health and substance use disorder services reduce the scourges of self-harm, interpersonal violence, and opioids. Walkable cities and accessible healthy foods reduce the incidence of diabetes. In the US, we are driven by concerns about perceived threats to personal liberty and the role of individual responsibility for self-improvement. Fears of the nanny state and an overreaching government abound. Government has proven much more effective at protecting public safety than encouraging socially desirable behavior. Our opportunities for a long and happy life, however, are, in part, a function not only of the choices each of us make, but of the ones we each face, which in turn are created by a set of public policy decisions made on our behalf. Research is making it clearer that while some of us are lucky, and some of us are virtuous, all of us live (and die) with the consequences of decisions our policy leaders are making for us.